Birds do the strangest things! 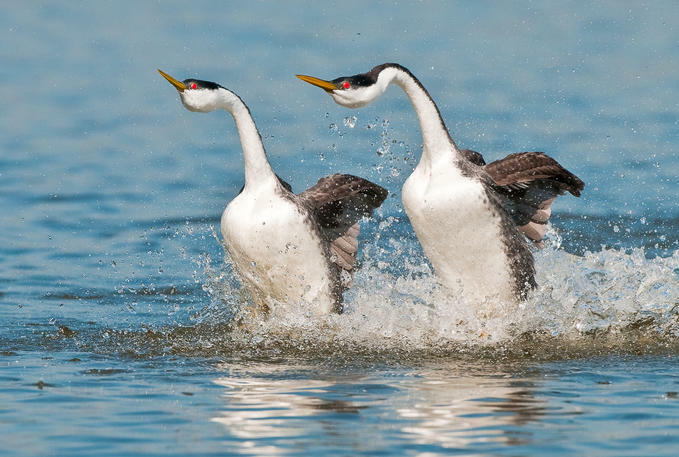 When a pair of Western Grebes decides it’s time to mate, they call loudly and approach one another. Each bird curves, then straightens, its long neck gracefully. They then face each other, necks on the water’s surface, their bills flipping up drops of water. If attraction prevails, they rush together and off they go across the water, running on the surface side by side. Standing straight up with necks held high and feet churning like propellers, they no longer look much like grebes - more like participants in Tchaikovsky’s ballet, Swan Lake. Be sure to watch the video, below! When a pair of Western Grebes decides it’s time to mate, it’s as if they know they have an audience for the performance they’re about to give. On the still waters of an alkaline lake, they call loudly and approach one another. [Western Grebe calls] Each bird curves, then straightens, its long neck gracefully. They then face each other, necks on the water’s surface, their bills flipping up drops of water. If attraction prevails, they rush together and off they go across the water, running on the surface side by side. [Western Grebes running on the water] Standing straight up with necks held high and feet churning like propellers, they no longer look much like grebes -- more like participants in Tchaikovsky’s ballet, Swan Lake. After their lengthy pas de deux, with wings extended like parallel sails, they plunge below the surface. What follows is the "weed ceremony," each bird diving to pick up a beakful of soft vegetation. The grebes then stand up in the water, face one another, press tightly together, then drop the plants and preen. The whole courtship sequence may begin again at any time, building in intensity as spring progresses and the pair makes ready to start a new generation. You can see a video of the Western Grebes’ mating dance at birdnote.org. Bird sounds provided by The Macaulay Library at the Cornell Lab of Ornithology, Ithaca, New York. Recorded by R.C. Stein. Selections from Tchaikovsky's ballet, Swan Lake as performed by The Boston Symphony Orchestra, 1979, Deutsche Grammophone. Check out this photo of the "weed ceremony"